The record is made up of 1 volume (515 folios). It was created in 25 Feb 1933-21 Mar 1935. It was written in English. The original is part of the British Library: India Office The department of the British Government to which the Government of India reported between 1858 and 1947. The successor to the Court of Directors. Records and Private Papers. This volume, which largely consists of copies of Foreign Office and Colonial Office correspondence, concerns affairs on the Nejd-Transjordan frontier and relations between Amir Abdullah [ʿAbdullāh bin Ḥusayn al-Hāshimī] and Ibn Saud [‘Abd al-‘Azīz bin ‘Abd al-Raḥmān bin Fayṣal Āl Sa‘ūd]. Mutual recognition between Ibn Saud and Amir Abdullah. The possibility of determining the nationality of tribes based on or near to the Saudi-Transjordan frontier. Reports of exchanges of personal communications between Amir Abdullah and Ibn Saud, and proposals for a meeting between the two rulers. Amir Abdullah's visit to Bagdad [Baghdad] in April 1934. Reported anti-Saudi activities in Transjordan. 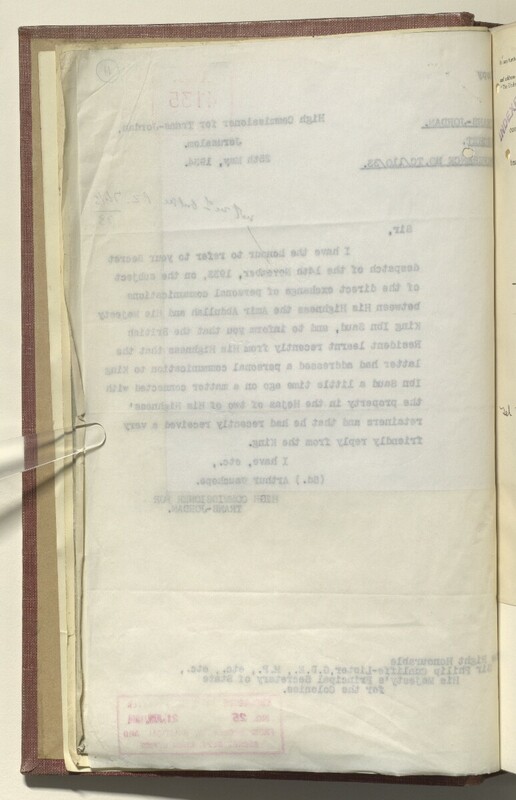 In addition to correspondence the volume includes the following: copies of a draft treaty of friendship between Saudi Arabia and Transjordan; extracts from Transjordan political situation reports (1933-1934). The volume includes three dividers which give a list of correspondence references contained in the volume by year. These are placed at the back of the correspondence (folios 3-5). Foliation: the foliation sequence commences at the first folio with 1 and terminates at the last folio with 515; these numbers are written in pencil, are circled, and are located in the top right corner of the recto The front of a sheet of paper or leaf, often abbreviated to 'r'. side of each folio. The foliation sequence does not include the front and back covers. An additional foliation sequence is present in parallel between ff 156-176; these numbers are also written in pencil, but are not circled. A previous foliation sequence, which is also circled, has been superseded and therefore crossed out.